A RECORD HIGH TEMPERATURE OF 68 DEGREES WAS SET AT CHARLESTON WV TODAY. THIS TIES THE OLD RECORD OF 68 SET IN 1925. A RECORD HIGH TEMPERATURE OF 65 DEGREES WAS SET AT WASHINGTON DULLES DC TODAY. THIS BREAKS THE OLD RECORD OF 59 SET IN 2005. THIS AFTERNOON...ANOTHER RECORD EVENT REPORT WILL BE ISSUED LATER. RECORD EVENT REPORT WILL BE ISSUED LATER. RECORD OF 55 DEGREES SET IN 1990. A CONTINUOUS WEATHER RECORD HAS BEEN KEPT FOR HARRISBURG SINCE 1888. A RECORD HIGH TEMPERATURE OF 61 DEGREES WAS SET AT GEORGETOWN DE TODAY. THIS BREAKS THE OLD RECORD OF 60 SET IN 1965. Forecasters said the worst of the weather was likely to be in the Midlands with as much as 10cm (4in) of snow, however the south and west of England and Wales ground to a halt today after waking up to their heaviest falls of snow this week. The snowiest British winter of the 20th century was in 1947 (the coldest was 1963), when snow fell somewhere in the UK every day from 22 January to 17 March. Patches of sleet and snow edging southeastwards across England and Wales, with locally heavy snow developing across parts of southern and eastern England later. Scotland and Northern Ireland will have scattered wintry showers. Widespread ice will form across the UK. Locally heavy snow across southern and eastern England, especially during the morning. Elsewhere, brighter with some sunshine, but cold. Scattered wintry showers will affect northern and western areas. The cold weather blog is still eating it up, while drooling over the no-skill 252-hour forecast for Feb. 15. "Orange-Juice Futures Slide 8.3% as Florida Crops Skirt Cold Snap". Git out the mukluks and the mastodon traps, maw, the Ice Age is nigh! And Al Gore is still fat! "Trudging around snowy London, it was impossible to escape another thought: Surely what's true of the weather is true of other kinds of unexpected change, too. People who no longer remember slow economic growth, for example, might not be able to cope with negative growth, let alone a severe recession. In London, it hasn't snowed much for 18 years, so no one owns a snow shovel -- and if they do, they don't know how to use it. In the United States, the economy hasn't really collapsed since 1929, so no one knows how to save string and tinfoil -- and if they did, they wouldn't know what to do with them. A whole set of skills, from cooking with leftovers to recycling bottles (not because it's green, but because it's thrifty) has been lost during two generations of prosperity, in much the same way the British have forgotten how to drive their cars through slush." Video from the BBC is here. The heaviest snowfall for 18 years paralysed swaths of the country yesterday, bringing chaos to roads, railways and airports, closing thousands of schools and businesses, and costing the economy an estimated £1.2bn in lost working hours. 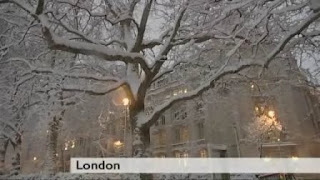 Although the snow had been forecast since last week, much of Britain was overwhelmed, with conditions forcing one in five workers to stay at home, as many as 3,000 schools closed and many non-urgent hospital operations were postponed. 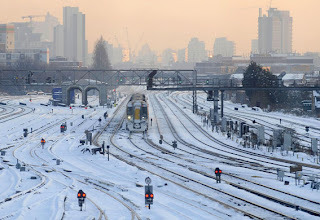 The south-east bore the brunt of the snow, which settled to a depth of 25cm (10in) in Kent and Surrey, and saw all flights cancelled at Heathrow and London City airports, leaving thousands stranded. London's public transport system buckled under the stress, with all but a handful of bus routes cancelled yesterday morning and 10 of the 11 underground lines either completely or partly suspended. The cold weather hype machine is loving it. This just in, however, the seasons haven't been repealed: "Despite global warming, snow still exists". 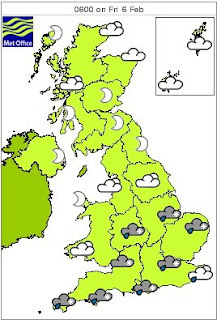 The UK Met Office's latest forecast calls for the snow to be moving northward on Tuesday.